Falling Skies is a Sci-Fi drama produced by Steven Speilberg which premiered on TNT starting July 19th, and airs weekly on Sundays at 10PM/9c. With the summer notoriously lacking in good programming, this show is certainly worthy of some attention. What follows takes the first five episodes into account and will be spoiler free, so you can start from episode one without ruining any plot twists, surprises, or plot devices used to advance the story. 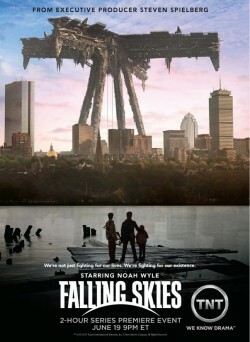 The world is has faced an apocalyptic alien invasion which resulted in 90% of the population being wiped out. Nobody knows where these aliens are from or why they have come to Earth. The story begins six months after the actual invasion and follows a band of survivors who attempt to scavenge what they can to carry on and fight back, although with the success rate of one step forward and two steps back. You can view the official show trailer here, though it doesn’t really do the show justice. Starring is Noah Wyle, probably most prominently known for is lead in The Librarian series, where he played bookworm turned treasure hunter, which draws on elements from several classic action movies. Another familiar face, Moon Bloodgood, known for her roles in Terminator Salvation, Pathfinder, and Journeyman. Will Patton, known for a starring role opposite Kevin Costner in post-apocalyptic film The Postman, plus various minor and supporting roles in Armageddon, Entrapment, Gone in 60 Seconds, Remember the Titans, and The Punisher. Dale Dyle, a military man often consulting with or seen in military films and TV series, such as Saving Private Ryan, Platoon, Starship Troopers, Band of Brothers, The Pacific, and Rough Riders. Also making an appearance is Colin Cunningham, known for his recurring role on Stargate SG-1. Sarah Carter, known for a guest role on Smallville, plus a number of minor roles in movies and TV shows in the fantasy, horror, and drama genres. The rest of the starring and recurring cast members haven’t had extensive exposure in the Sci-Fi arena, but also include Drew Roy, Jessy Schram, Seychelle Gabriel, Peter Shinkoda, and Connor Jessup. Recurring cast members (not already mentioned) include Bruce Gray, Martin Roach, and Steven Weber. They don’t skimp on the special effects. Neither the practical nor CGI special effects interrupt or distract from the story as it unfolds. There’s nothing that bothers me more and shatters the illusion of a good story than poorly executed special effects, although I tend to give a bit more leeway with TV shows. The overall story arc has been slowly and carefully introducing key nuggets of information–all the while building tension and suspense, with bursts of action propelling the story forward. Elements of mystery and problem solving enter the fray. All this is very rare to find in a single TV show or movie these days. Also introduced are some uncomfortably alien situations, which can throw your perspective slightly off-kilter. It’s rare to find a solid story element that hasn’t be recycled in the same way dozens of times in other stories. It adds layers to the mystery and suspense of these alien invaders. The acting is great. None of the characters seem out of place, and everyone seems to have given it their all. I was a little wary of what Noah Wyle might be like, considering his quirky, over-the-top, and small budget feel of his role in The Librarian series. But, after just the first episode, that thinking was quickly dispelled, as he seemed to be a great fit in the show. The sappy hallmark moments intended as character development tend to be forced and seem out of place (however, this doesn’t start getting intolerable until episodes 4 and 5 when the story arc takes a break from the tension, suspense, and action for a few moments). They add backstory to the characters and attempt to explain why they act the way they do and how they ended up where they are, but not in a manner which is easy to swallow. There are good ways and poor ways to create a character’s backstory, and so far, they mostly fall flat. Despite the show’s one obvious drawback, it still is only one minor element out of this entire show. 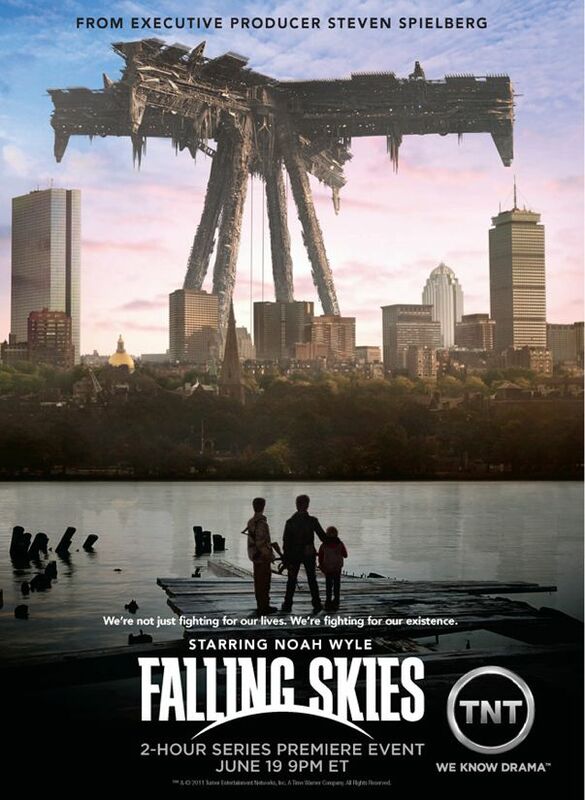 Grab some popcorn, catch up on Falling Skies on TNT’s website or the iTunes Store, and settle in for the Sci-Fi TV adventure of the summer. It should be an interesting ride. 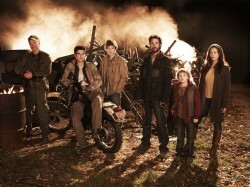 Season one has a run of 10 episodes, and the show has already been renewed for a second season featuring 10 more. When a show is offered renewal this quickly (especially when networks have been quick to cancel shows lately), there’s certainly some hint there which says it must be something interesting to keep an eye on.